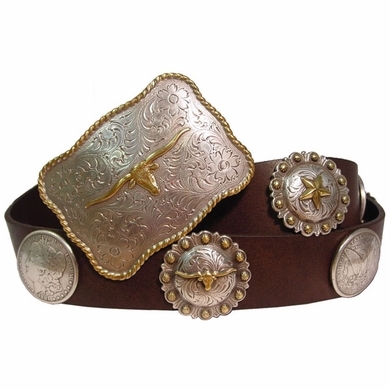 Big Golden Longhorn Western Buckle with a variety of conchos: Star concho, Longhorn Concho, Liberty Concho, Eagle Concho, and Berry Conchos, all on a Full Grain Leather Belt. Made with snaps for interchangeable buckles: Just snap off and snap on. Buckle size: width 3 3/4" High 2 3/4".